Some natural opals, mostly from Ethiopia, show a macroscopic finger-like structure called a digit pattern. This pattern consists of vertical columns that are more or less parallel, separated by a homogeneous matrix of different color, transparency, or play-of-color. This study proposes that digits develop through: (1) the deposition of a homogeneous opal layer and subsequent polygonization in the form of vertical columns; (2) preferential alteration of this layer at the vertical grain and sub-grain boundaries, creating the digit shape; (3) precipitation of a new silica gel in the space between the digits; and (4) the drying and solidification of the opal. Although polygonization in the form of vertical columns is a growth process typical of synthetic opal, the post-growth alteration of these columns into digits and the deposition of matrix are observed only in natural opal. Opal is a poorly crystallized or amorphous hydrated silica formed through the solidification of a silica gel (Jones and Segnit, 1971). The most valuable variety is “precious opal,” which displays play-of-color: patches of pure spectral colors from violet to red flashing over the stone as it is tilted. Precious opals are mined in many parts of the world, most notably in Australia, Brazil, Mexico, and Ethiopia. Other sources include the United States, Honduras, and Java. Ethiopia has been a major producer since the 2008 discovery of abundant opal at Wegel Tena, in the northeastern Wollo Province (Rondeau et al., 2009, 2010; Mazzero et al., 2009, 2010). Play-of-color arises from the diffraction of visible light on monosized, well-ordered silica spheres in opal-A (Sanders 1964; Darragh and Sanders, 1965), and lepispheres in opal-CT (Flörke et al., 1976) of appropriate diameter. Most often, play-of-color involves several juxtaposed patches of various diffraction colors. In rare cases, a network of silica spheres is distributed over the whole stone, so that the color patches move in unison. Such samples are considered natural “photonic” crystals. Whereas a crystal sensu stricto diffracts X-rays, a photonic crystal diffracts wavelengths in the visible range of the spectrum, giving rise to visible play-of-color. The diffraction colors in precious opal can be arranged in a variety of patterns, including intense specks (pinfire), flames, bands, and juxtaposed polygons (harlequin opal). Straight black lines or bands often cross the patches, and these are due to polysynthetic or mechanical twin planes of the photonic crystal, merging at the surface of the gem (Kinder, 1969; Gauthier, 1985). 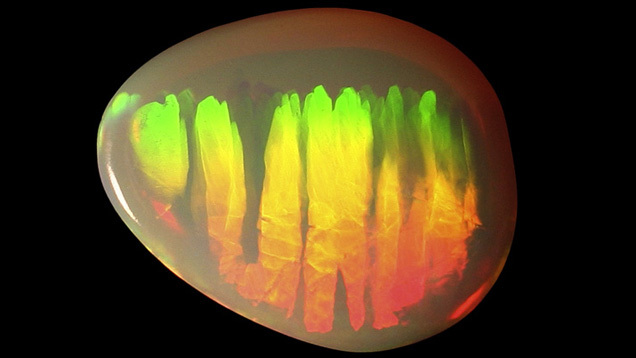 Unlike precious opal, common opals do not display play-of-color, usually because the silica spheres lack regular packing (Gaillou et al., 2008). 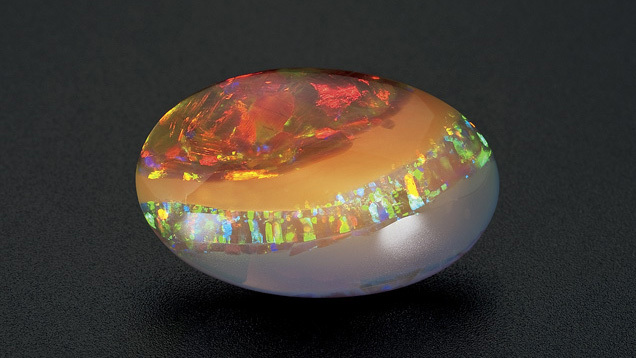 Although some rare opals are colorless, most specimens present a bodycolor: white, black, gray, brown, yellow to orange (as in fire opal), red, pink, blue, green, or violet. These colors are typically due to minute mineral inclusions colored by transition metal ions that absorb part of the visible spectrum of light. These include iron for yellow to orange to brown (fire opal), copper for a saturated blue (“Peruvian opal”), and nickel for green (chrysopal; Fritsch et al., 1999). Other causes of color in the inclusions are color centers (purple fluorite inclusions) and organic compounds (quinones in pink opals; Mathey and Luckins, 1998; Fritsch et al., 2004). Figure 1. Digits in an Ethiopian opal from Mezezo, in Ethiopia’s Shewa Province. Digits are rounded, finger-like columns of opal embedded in a matrix of opal with a different appearance. This 1.5 cm stone shows rounded patches on one side (left) and columns on the other side (right). Photos by F. Mazzero. 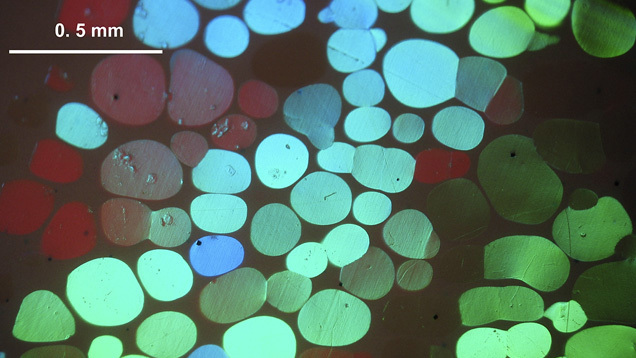 In this article, we document an optical feature encountered in some gem opals: Viewed in one direction, the surface shows a mosaic of polygonal to rounded patches of opal, separated by a homogeneous matrix of distinctly different opal. When viewed from the perpendicular direction, these patches appear more elongated and parallel, like columns, that are rounded at one end (figure 1). Each column represents a grain made up of a homogeneous network of silica spheres. The resulting three-dimensional feature’s resemblance to fingers (at the millimeter scale), inspired us to call them digits (Gauthier et al., 2004; Rondeau et al., 2010). This feature has also been described by other gemologists (Hainschwang, 2006; Choudhary, 2008). Digits are most spectacular when the rounded columns possess play-of-color and the matrix is common opal, as shown in figure 1. Digits are so frequently observed in Ethiopian opals, either from Wegel Tena in Wollo Province (Rondeau et al., 2010) or from Mezezo in Shewa Province (Johnson et al., 1996; Mazzero, 2003) that they have become the industry’s unofficial identifier for Ethiopian opal. Examples have occasionally been reported from other deposits, such as Virgin Valley, Nevada (Gübelin and Koivula, 2005; Gaber, 2007). Digits have been reported in only one Australian sample (figure 2). This paper aims to provide further documentation on digit patterns by proposing a model for their formation. Figure 2. A rare observation of digits in Australian common opal (potch) from Coober Pedy. The sample is 3 cm across. Photo by E. Fritsch. All Ethiopian samples were rough or cabochon opals collected in the gem market at Addis Ababa, Ethiopia, between 2008 and 2011. Their digit patterns were observable with the unaided eye at the millimeter or centimeter scale (again, see figure 1). From thousands of samples examined, more than 10% of them showed digit patterns. We documented those that showed spectacular or interesting features before they were sold. The specimen from Honduras was photographed during the 2011 Sainte-Marie-aux-Mines gem and mineral show (see figure 14). The specimen from Australia (figure 2) was photographed at the Coober Pedy mine. We photographed the specimens using a camera equipped with either a macro objective lens or a binocular microscope with up to 50× magnification. As defined earlier, digits are characterized by their shape and revealed by the optical contrast between the columns and the matrix. This section provides observations and interpretation useful for establishing a formation model. Variation in the Appearance of the Digits. In samples that contain abundant matrix and few play-of-color patches, the digits are clearly rounded at the ends (again, see figure 1). In samples that contain less matrix and abundant patches, the digit ends are less rounded and more polygonal (figure 3). Some samples display juxtaposed, polygonal columns with no matrix at all in between. In this last case, the digit pattern is no longer visible, and such stones show, in a transversal section, juxtaposed polygonal columns of play-of-color opal (as in the lower right part of figure 3). This is somewhat similar to the harlequin opal. Figure 3. The patches of play-of-color are rounded and separated by a continuous network of matrix in the upper part of this opal, but the matrix diminishes toward the lower right as the patches become more polygonal. This 32 × 28 mm Ethiopian sample is from Mezezo, Shewa Province. Photo by F. Mazzero. When digits are polygonal or nearly polygonal (with no matrix or little matrix, respectively), one can observe their cross-sections; these are usually pentagonal or hexagonal. That is, each cross-section is generally five- or six-sided and neighbored by five or six others (again, see figure 3). In only one sample did we encounter polygonal digits with matrix in between with irregular, angular shapes instead of rounded ones (figure 4). Figure 4. In this unusual 23.83 ct opal from Wollo, Ethiopia, play-of-color patches are not rounded but irregular, though the matrix is abundant. Photo by B. Rondeau. Digits are most pronounced in play-of-color opal, though they also exist very rarely in common opal (again, see figure 2). These digits can be displayed in opals with various bodycolors—from white to gray to brown—and a range of transparencies. 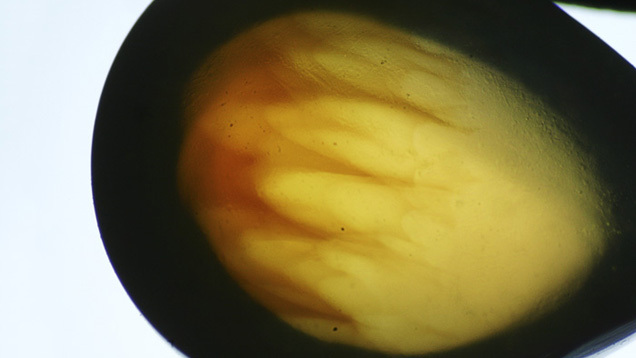 The matrix typically has a similar hue but is less transparent, though this is not always the case: Figure 5 shows a sample with colorless to whitish digits embedded in a brownish orange common opal matrix. Figure 5. Some samples, such as this 1.29 ct Ethiopian opal from Wollo, show colorless to whitish digits in a matrix that appears brownish in transmitted light. Such contrast in bodycolor is rare. Photo by B. Rondeau. Play-of-Color Network Preceding the Formation of Digits. When digits are composed of precious opal, the play-of-color network is usually continuous from one patch to another. In some cases, the whole sample consists of a single network of diffracting opal, subdivided into digits (figure 6). We also observed that twin planes are continuous from one digit to its neighbors (figure 7). These observations indicate that some digits may result from the cross-section partitioning of a larger, preexisting opal. Digit patterns that are not continuous, but display very similar diffraction colors from one patch to the next, may be the result of slight misorientation in the silica sphere network (figure 8). Figure 6. All adjacent patches show a single diffraction color for a given viewing position. Hence, the silica spheres are packed to form a single regular, continuous network throughout the whole sample. This 14.84 ct sample is from Wollo, Ethiopia. Photo by B. Rondeau. Figure 7. In this opal from Wollo, the striations corresponding to twinning planes are continuous from one digit to the next, indicating that the digits originated from the same photonic crystal. Field of view: 5 mm. Photo by J.-P. Gauthier. Figure 8. Due to slight changes in the angle of refraction from one sub-grain to the next, the diffraction color changes in this sample from Mezezo. Photo by J.-P. Gauthier. Digits Developing Vertically. Many opal deposits in the world provide samples that show parallel layers of opal that contrast in both color and transparency. These banded opals formed by successive deposition of opal layers, each layer varying slightly in composition. The layering plane is parallel with the surface (e.g., Escard, 1914). When such samples contain digits, the digits are always perpendicular to the banding, indicating that they developed vertically (figure 9). We observed digits in dozens of banded opal samples, all showing the same orientation. Figure 9. 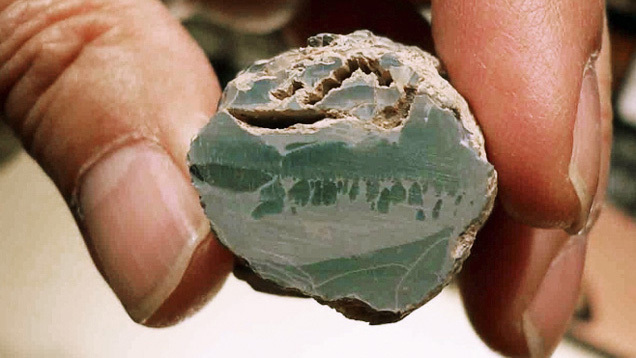 This 18.68 ct specimen from Wollo shows several different layers of opal, revealing several influxes of silica gel during the formation of the opal and its digits. Note that the digits are perpendicular to the banding. Photo by Robert Weldon, © GIA. Digits with Rounded Ends Facing Upward. Two rough banded samples showed a flat surface that represents the last horizontal layer deposited. This has been clearly established by our many field observations (e.g., figure 10) and documented in several other deposits (e.g., Escard, 1914). This happens when the silica gel does not entirely fill the cavity where the opal is forming. When samples contain digits, their rounded ends always point upward (figure 11). Figure 10. Sometimes opal observed in the field only partially fills cavities. 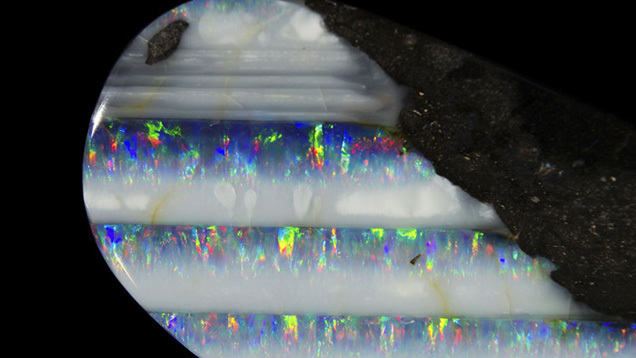 In such cases, the top surface of the opal is usually flat and horizontal, with the top of the cavity remaining empty. This specimen is shown in a weathered ignimbritic host rock in Ethiopia. The arrow points upward. Picture width: 2 cm. Photo by B. Rondeau. Figure 11. 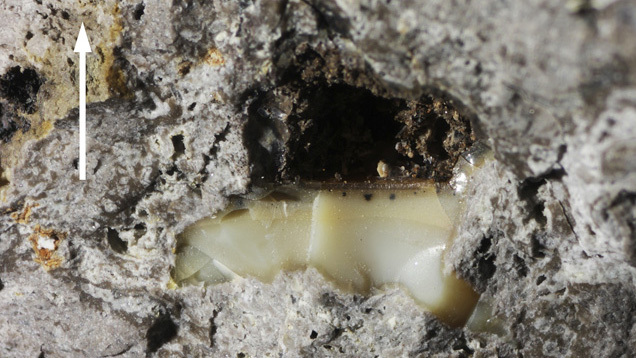 The cavity where this opal from Wollo formed was only partially filled during formation, leaving a free horizontal surface on top. The bottom horizontal layer shows digit patterns that developed vertically, the rounded ends pointing upward. Photographed in transmitted light (left) and reflected light (right). Field of view 1.5 cm. Photos by B. Rondeau. Some digit-bearing samples showed a layering of play-of-color. The diffraction colors progressively shifted from red to yellow to green in a given position of observation (figure 12). This indicates that the silica spheres’ diameter progressively diminishes from larger (red diffraction) to smaller (green diffraction); see Sanders (1964) and Darragh and Sanders (1965). In specimens where the top and bottom are known, this layering has been observed as horizontal, with the red layer corresponding to the bottom and the green layer to the top. Such a distribution is controlled by gravity during the sedimentation of the silica spheres: larger spheres sediment first, followed by progressively smaller spheres. Again, in samples we examined that showed this color zoning, the digits were perpendicular to the horizontal layering, their rounded ends pointing upward (figure 12). Figure 12. The shift from red (bottom) to green (top) diffraction colors indicates a regular size gradation of the spheres: larger spheres at the bottom, smaller spheres at the top. This 3.90 ct sample from Wollo is shown in the same position as when the spheres were deposited, with the rounded ends of the digits pointing upward. Photo by D. Goubert. A Model for Digit Formation. Based on the previous observations, we propose a step-by-step model for digit formation, illustrated in figure 13. This model deals specifically with the development of digits in play-of-color opal. Figure 13. Our model of digit formation contains four basic steps: (1) sedimentation of silica spheres, taking on a columnar structure after dehydration; (2) polygonization of the color patches; (3) influx of water, altering the columns by progressive erosion along the polygonal boundaries; and (4) settling of new interstitial silica-rich filler, formation of silica lepispheres, and dehydration. Step 1: Formation of Play-of-Color Opal in Silica Gel. Hydrated spheres of silica combine to form either a single large, homogeneous photonic crystal or several juxtaposed ones, forming prismatic, vertical columns. Step 2: Polygonization of the Crystals. Photonic crystals split into juxtaposed columns, polygonal in cross-section (which we refer to as sub-grains). Each column generally has five to six faces per prism, but may have four or seven in rare cases. Step 3: Remobilization of the Photonic Crystal by a New Fluid with Opal Etching Properties. Alteration of the photonic crystal by remobilization of the silica spheres occurs preferentially at the grain and sub-grain boundaries, which offer more available surface. Individual columns (either grains or sub-grains) then acquire their rounded shape, forming true digits. Step 4: Deposition of Common Opal. Changes in local chemical conditions lead to deposition in the remaining spaces between digits. When step 3 is more pronounced, so is step 4. Step 5: Additional Deposition. Additional horizontal layers of opal of any variety may also be deposited. Step 6: Solidification. Through dehydration and cementation, this silica gel forms a solid opal. We encountered digits much less frequently in common opal (again, see figure 2), possibly because they are much less conspicuous than digits in play-of-color opal. Digits in common opal form according to a very similar model. In this case, step 1 produces a homogeneous layer of common opal, while step 2 gives rise to the columns, presumably through shrinkage during compaction. The rest of the process is identical. How Does Polygonization Occur? Polygonization (step 2) also occurs in synthetic opal. It happens after the silica spheres are deposited and while the silica gel is drying (Nassau, 1980). Polygonization may be due to the bonding forces between the gel and the walls of the cavity that contains the gel. Alternatively, it may occur because of the expulsion of the liquid from the silica gel (dehydration), producing a contraction effect, a phenomenon known as syneresis. Syneresis should create some space between the columns, but this was not observed in our samples. In either case, columns are vertical because there is a free horizontal surface at the top of the gel. Polygonal columns in opal evoke the basaltic prism that forms due to shrinkage during magma cooling. Figure 14. Some digits show different play-of-color (here, orange) at their boundaries, possibly as a result of progressive water impregnation from the matrix toward the digits. The opal patches at the red arrows show secondary re-polygonization. This sample is from Wollo, Ethiopia. Photo by J.-P. Gauthier. There can be several orders of polygonization. Sub-grains produced by polygonization can in turn polygonize (as indicated by the red arrows in figure 14). 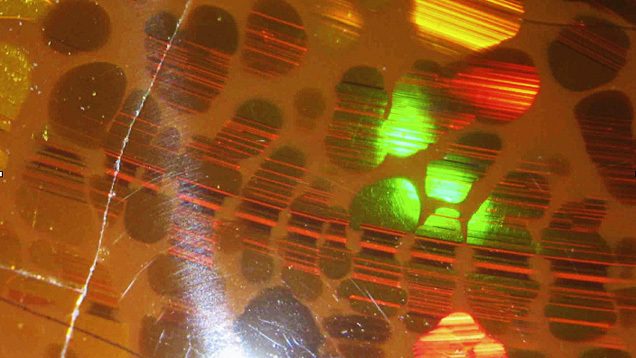 Multiple generations of polygonization are responsible for the “lizard-skin” optical effect typical of synthetic opal (Nassau, 1980; Gauthier, 2004) and rarely observed in natural opal. How Does Remobilization (Step 3) Occur? Similar rounded shapes are found in many crystals in nature, such as beryl or diamond. Those are generated by dissolution processes (Sunagawa, 2005). This happens when the growth medium turns unfavorable due to changes in temperature, pressure, oxygen fugacity, redox conditions, chemical potential, or other variables. In the case of opal, remobilization of the silica spheres is enough to cause erosion of the photonic crystal, rather than true dissolution. This may occur when an influx of water with a lower silica content leads to the remobilization of the previously deposited silica. In samples that are well separated by abundant matrix, and have thus undergone more significant alteration, the digits show a more rounded shape. Variations on the Model. All these steps can occur in a single sample, in particular when alteration (step 3) only affects the upper part of the columns. More often, some steps are not seen because the sample was cut or broken during mining. For example, the stone in figure 3 shows only steps 2 (polygons of play-of-color opal) through 4 (rounded patches separated by some matrix). Likewise, figure 11 shows the result of steps 4 and 5 only. Patterns formed by only steps 1 and 2 are common in opals from many deposits, including Australia (Pecover, 2010), and those in thin fractures in basalts from Honduras (figure 15). Such samples show a “honeycomb” structure (Maddison, 1992) somewhat similar to that observed in synthetic opal, in which case digits did not develop because no remobilization stage occurred. Figure 15. Opals found in thin fractures in basalt from Honduras commonly show pronounced banding that marks the horizontal level. Play-of-color bands have a vertical, columnar shape that corresponds to steps 1 and 2 of digit pattern development. Field of view: 6 cm. Photo by B. Rondeau. In one case we observed that remobilization can disrupt the digits’ play-of-color. In figure 14, most of the digits diffract a green light, while orange diffraction occurs between the digits and matrix. The orange diffraction may be the result of higher water content between the silica spheres at this contact point (as described in Gauthier, 2004). This may indicate that remobilization sometimes happens progressively, and not always abruptly. Alternatively, this feature may result from the overgrowth of a higher-water-content layer at the early stage of binder formation. Figure 16. Some rare samples show a play-of-color matrix around play-of-color digits with a different diffraction color. These samples are from Mezezo (left) and Wollo (right). Photos by B. Rondeau. Two samples also showed play-of-color in the matrix around the digits, but with a different orientation of diffraction (figure 16). Another one showed features that resembled digits, but with angular shapes (e.g., figure 4) or non-parallel digits. This can be explained by additional local forces or parameters that perturb the “regular” model. For example, we propose that non-vertical digits developed when the cavity was totally filled with silica gel, as opposed to the normal free, horizontal surface in a partially filled cavity, producing a different strain distribution. Such variations may be worth investigating further. Confusion with Synthetics. 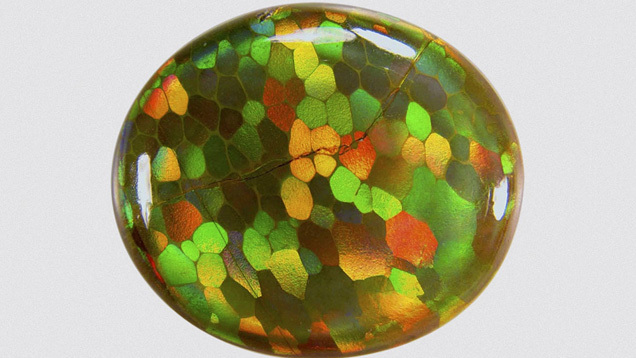 Ethiopian opals showing the “lizard-skin” effect are not uncommon, as in the bottom right area of the stone in figure 3. This may cause confusion with synthetic opals (e.g., Choudhary, 2008). The presence of a matrix between the columns may therefore be the first step in identifying a natural opal. When no matrix is present, other indicators are inclusions typical of Ethiopian opals, such as opaque black octahedra, pyrite cubes, or rootlet fossils (Gauthier et al., 2013). 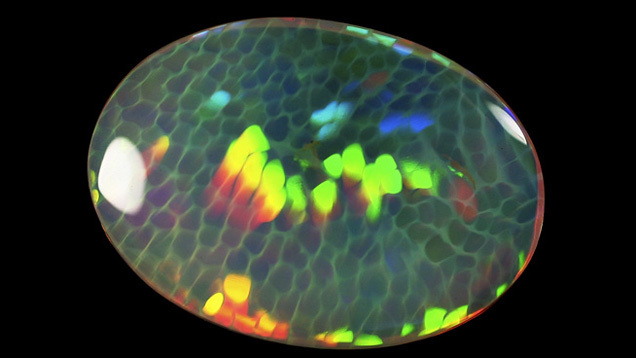 This study has documented the macroscopic characteristics of digits, distinct aesthetic features observed in many natural opals from Ethiopia but rarely seen in specimens from other regions. We propose that these columns form vertically with their rounded ends pointing upward, and that larger patches of color formed before the matrix. The first step in our model is the deposition of a homogeneous layer of opal with juxtaposed vertical columns. Next, polygonization of the columns occurs. Then, an influx of fluid (probably less rich in silica) remobilizes this layer. The remobilization is most efficient at grain boundaries, separating the columns and rounding their edges. Finally, opal precipitates again between the partially dissolved columns, cementing them into a matrix of either common or play-of-color opal. Among the open questions remaining, we emphasize that the process by which remobilization occurs remains unclear: Is this a true dissolution process, in which silica spheres dissolve into water, or do the spheres remain intact but dispersed into the gel? Also, the combination of geological conditions necessary for digits to form have been encountered in Ethiopia but are uncommon in other localities: What makes this combination so rare? Dr. Rondeau (benjamin.rondeau@univ-nantes.fr) is assistant professor, Dr. Bodeur is a geologist, and Chauviré is a Ph.D. student at the University of Nantes, Laboratoire de Planétologie et Géodynamique, UMR-CNRS 6112. Jean-Pierre Gauthier is a gemologist at Centre de Recherches Gemmologiques in Nantes. Francesco Mazzero is manager of Opalinda in Paris. Dr. Fritsch is professor of physics at University of Nantes, Institut des Matériaux Jean Rouxel, UMR-CNRS 6205. We wish to thank Drs. Mary Johnson and Ahmadjan Abduriyim for reviewing and improving this article. We also thank Eyassu Bekele (Eyaopal, Addis Ababa, Ethiopia) and Thomas Cenki (Opalinda, Paris) who captured many samples of interest for this study, and the numerous miners in Ethiopia and Australia who provided useful information regarding the mode of occurrence of opal in the field. Choudhary G. (2008) Gem News International: An interesting opal. G&G, Vol. 44, No. 2, pp. 172–174. Darragh P.J., Sanders J.V. (1965) The origin of color in opal based on electron microscopy. G&G, Vol. 11, No. 10, pp. 291–298. Escard J. (1914) Les Pierres Précieuses. H. Dunod & E. Pinat Ed., Paris, 520 pp. Flörke O.W., Hollmann R., von Rad U.V., Rösch H. (1976) Intergrowth and twinning in opal-CT lepispheres. Contributions to Mineralogy and Petrology, Vol. 58, No. 3, pp. 235–242. Fritsch E., Rondeau B., Ostrooumov M., Lasnier B., Marie A.-M., Barreau A., Wery J., Connoué J., Lefrant S. (1999) Découvertes récentes sur l’opale. Revue de Gemmologie a.f.g., Vol. 138/139, pp. 34–40. Fritsch E., Gaillou E., Ostroumov M., Rondeau B., Barreau A. (2004) Relationship between nanostructure and optical absorption in fibrous pink opals from Mexico and Peru. European Journal of Mineralogy, Vol. 16, pp. 743–752, http://dx.doi.org/10.1127/0935-1221/2004/0016-0743. Gaber C.J. (2007) Opal in the United States and Canada. In Opal, the Phenomenal Gemstone, Lithographie, LLC, East Hampton, CT, 82 pp. 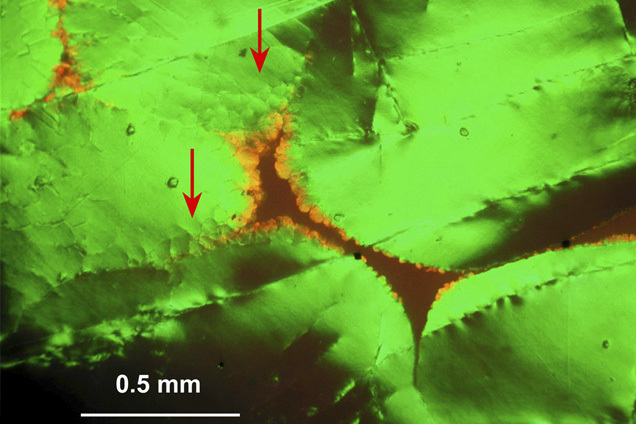 Gaillou E., Fritsch E., Aguilar-Reyes B., Rondeau B., Post J., Barreau A., Ostroumov M. (2008) Common gem opal: An investigation of micro- to nano-structure. American Mineralogist, Vol. 93, No. 11–12, pp. 1865–1873, http://dx.doi.org/10.2138/am.2008.2518. Gauthier J.-P. (1985) Observation directe par microscopie électronique à transmission de diverses variétés d’opale I. Opales nobles. Journal de Microscopie et Spectroscopie Electronique, Vol. 10, No. 2, pp. 117–128. ——— (2004) L’opale de synthèse. Revue de Gemmologie a.f.g., Vol. 149, pp. 24–26. Gauthier J.P., Mazzero F., Mandaba Y., Fritsch E. (2004) L’opale d’Ethiopie: Gemmologie ordinaire et caractéristiques exceptionnelles. Revue de Gemmologie a.f.g., Vol. 149, pp. 15–23. Gauthier J.-P., Mazzero F., Rondeau B., Fritsch E. (2013) De l’originalité des opales éthiopiennes. Revue de Gemmologie a.f.g., Vol. 184, pp. 11–16. Gübelin E., Koivula J.I. (2005) Photoatlas of Inclusions in Gemstones Volume 2. Opinio Verlag, Basel, Switzerland. 829 pp. 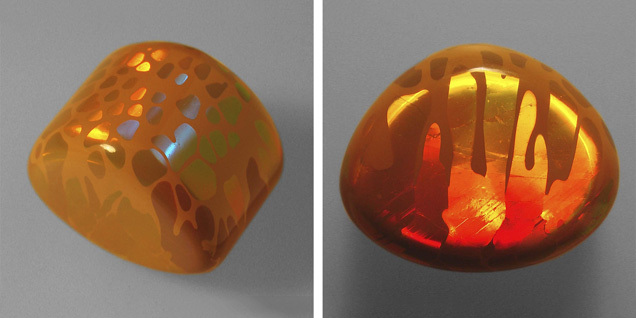 Hainschwang T. (2006) Gem News International: A large phenomenal fire opal with possible uranium-related luminescence. G&G, Vol. 42, No. 4, pp. 276–277. Johnson M.L., Kammerling R.C., DeGhionno D.G., Koivula J.I. (1996) Opal from Shewa Province, Ethiopia. G&G, Vol. 32, No. 2, pp. 112–120, http://dx.doi.org/10.5741/GEMS.32.2.112. Jones J.B., Segnit E.R. (1971) The nature of opal; I. Nomenclature and constituent phases. Journal of the Geological Society of Australia, Vol. 18, No. 1, pp. 57–68. Kinder E. (1969) Elektronenmikroskopische Untersuchungen an Edelopalen. Zeitschrift für Physik, Vol. 224, No. 1–3, pp. 74–84. 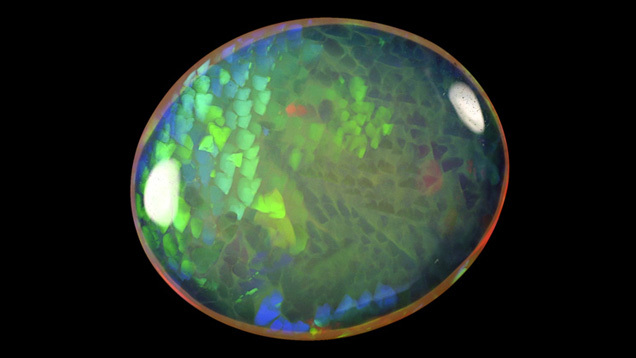 Maddison P. (1992) Gem Trade Lab Notes: Opal, with natural cellular structure. G&G, Vol. 28, No. 1, pp. 55–56. Mathey A., Luckins P. (1998) Spatial distribution of perylene­quinones in lichens and quincyite (rock) using confocal fluorescence microscopy. Focus on Microscopy 1998, Sydney, Australia. Mazzero F. (2003) A la découverte des gisements d'opale du Shewa, relation de voyage en Ethiopie. Revue de Gemmologie a.f.g., Vol. 148, pp. 27–31. Mazzero F., Gauthier J.P., Rondeau B., Fritsch E., Bekele E. (2009) Nouveau gisement d'opales d'Ethiopie dans la Province du Welo: Premières informations. Revue de Gemmologie a.f.g., Vol. 167, pp. 4–5. Mazzero F., Désagulier C., Rondeau B., Ayalew D., Ezezew G., Cenki T., Bekele E. (2010) L’opale du Wollo, Ethiopie: des mines de gisements. Revue de gemmologie a.f.g., Vol. 174, pp. 14–20. Nassau K. (1980) Gems Made By Man. Chilton Book Company, Radnor, PA, 364 pp. Pecover S.R. (2010) Fluid flow and brittle fracture textures in opal veins: Clues to the origin of opal in the Great Australian Basin. 13th Quadrennial IAGOD Symposium, Adelaide, Australia. Rondeau B., Mazzero F., Bekele E., Gauthier J.P., Fritsch E. (2009) Gem News International: New play-of-color opal from Welo, Ethiopia. G&G, Vol. 45, No. 1, pp. 59–60. Rondeau B., Fritsch E., Gauthier J.P., Mazzero F., Cenki-Tok B., Bekele E., Gaillou E. (2010) Play-of-color opal from Wegel Tena, Wollo Province, Ethiopia. G&G, Vol. 46, No. 2, pp. 90–105, http://dx.doi.org/10.5741/GEMS.46.2.90. Sanders J.V. (1964) Colour of precious opal. Nature, Vol. 204, No. 4964, pp. 1151–1153. Sunagawa, I. (2005) Crystals: Morphology, Growth and Perfection. Cambridge University Press, Cambridge, UK, 295 pp. Explore opal history, research, quality factors, and more in the GIA Gem Encyclopedia.